Sometimes there is a stinger to strong wind that makes the experience less than perfect. Tomorrow that stinger will probably be sporadic weak WNW -NNW gusts that will try to push the favorable El Norte (North) winds away from shore. This first image from John S’s weather station at the north end of the La Ventana campground shows such a day. A classic El Norte day is triggered by high pressure in the 4 corners or, less desirable, the 4 corners. This makes strong North wind blast down the Sea of Cortez. And if we have blue skies and inland valley heating then it is time for hero turns right at the beach. But in last decade we often have a NNW to WNW factor that makes for up and down and shifty winds at the beach. d valley heating then it is time for hero turns right at the beach. But in last decade we often have a NNW to WNW factor that makes for up and down and shifty winds at the beach. 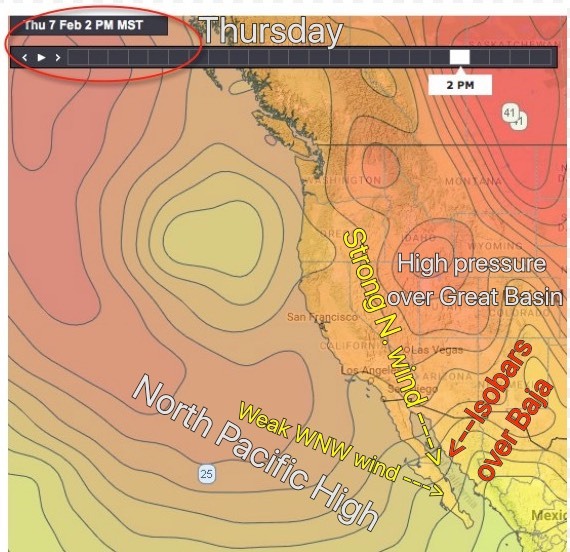 So for days I have been saying the wind drought will begin to end Wednesday Feb. 6 and really end with a bang Thursday. This brief blog shows you the big picture behind this event. Remeber that wind is always produced by a pressure gradient. At the most local level heating in a nearby valley makes low pressure and a pressure gradient from the cooler air just offshore. But for big winds you need a larger scale pressure gradient. In the first image you notice the huge dome of high pressure between the west coast and Hawaii. Note the isobars, lines of equal pressure, expending around the high pressure. 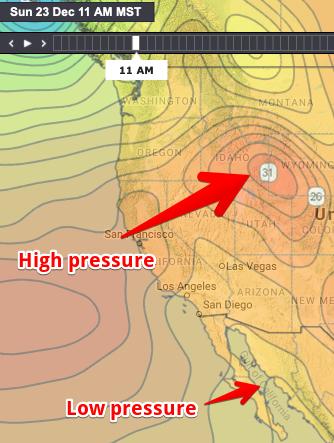 So there is a strong pressure gradient from the center of the high pressure to the west coast of the USA. Next notice the low pressure in the Great Basin and the isobars extending from that low. 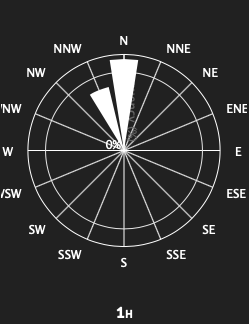 Lastly notice that neither of these features are causing isobars over the Sea of Cortez hence the weak winds today. Now look at the image on the right for Thursday. Notice how high pressure has developed in the Great Basin and how the North Pacific High has shifted southward towards Baja. Together these events have stacked isobars over the Sea of Cortez. This will make strong northerly winds over the Sea of Cortez. The Los Barriles beaches gets these winds pretty directly but La Ventana and El Sargento need a bit of a local pressure gradient to get the wind to curve into the beaches reliable. Because this is not a classic El Norte event with high pressure just in the 4 corners the overall wind will have a bit WNW to it due to the North Pacific High. So we really need blue skies over the Los Planes valley for quailty wind. In this image notice the isobar lines concentrate around the high-pressure zone in the northern Great Basin. Also notice how a few of those isobars are over the northern portion of Baja. The El Norte winds will begin to build in that area today. Then tomorrow that high pressure moves southward towards the 4 corners so the isobars extend all the way over Baja’s East Cape bringing strong El Norte winds. At the same time strong winds develop just aloft adding a real gust factor. Unfortunately, a combo of the upper trough and the subtropical jet stream will bring mostly heavy clouds aloft and to the surface. This means cool air and very UP AND DOWN shifty wind especially inside. 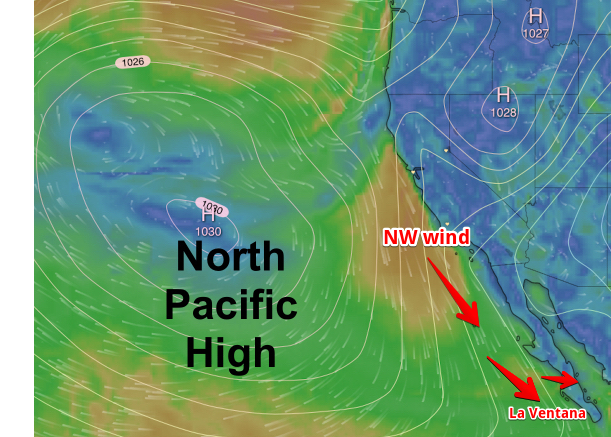 WEST COAST WIND BLOG: The North Pacific High makes winds more NW. The high pressure over the Great Basin weakens Sunday and moves eastward so the El Norte winds fade some. At the same on the Pacific side of Baja the North Pacific High builds and NW winds run down the Pacific and Sea of Cortez coasts. 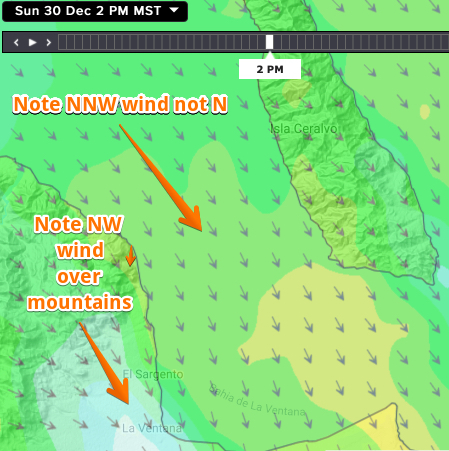 Some of that wind comes over the mountains and tries to push the El Norte winds away from shore especially at El Sargento and inside at La Ventana. This tends to make the winds weaker inside. If we get really good heating in the inland valleys this could curve the WNW wind into more favorable N. wind but given the clouds this is unlikely. Still, watch the western sky midday for clealring and hope that my forecast is too low! 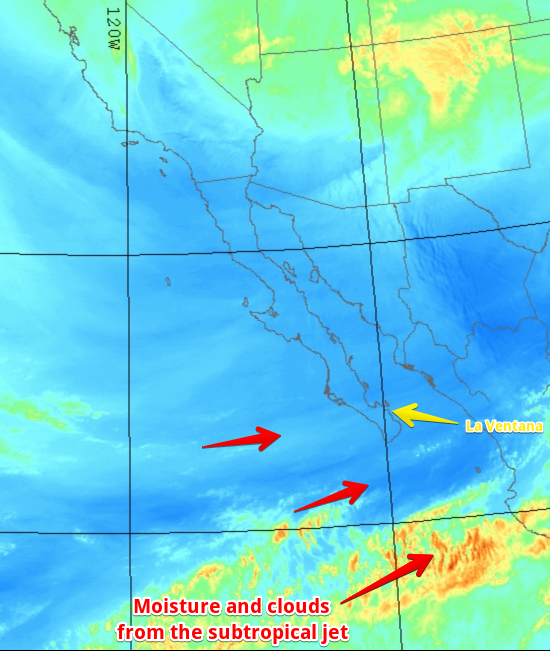 West Coast Wind Blog: El Norte vs. Subtropical Jet Stream & low clouds. Daily human La Ventana & Los Barriles forecast. promised clouds are an issue. The satellite imagery shows that the high subtropical jet stream clouds are quite sparse and by themselves would only shave a few knots of the wind by limiting the inland valley heating and local pressure gradient. However lots of patchy but heavy low clouds will be an issue especially in the morning. The latest output from the models suggest we get some clearing this afternoon so there is still hope for fairly reliable winds at the beach. Nice blue skies yesterday and today but looking at the image below you can see in yellow and orange the moisture and clouds of the subtropical jet stream above 10,000 ft. This mass of water vapor is streaming from the WSW and several models have it moving northward over Baja’s East Cape tomorrow. If this happens and the high clouds are thick then they will weaken the local sea breezes and make it harder for the El Norte winds to curve into our beaches. Right now my guess based upon watching the satellite imagery is that these clouds mostly stay south of Los Barriles. coast and the pacific Baja coast. 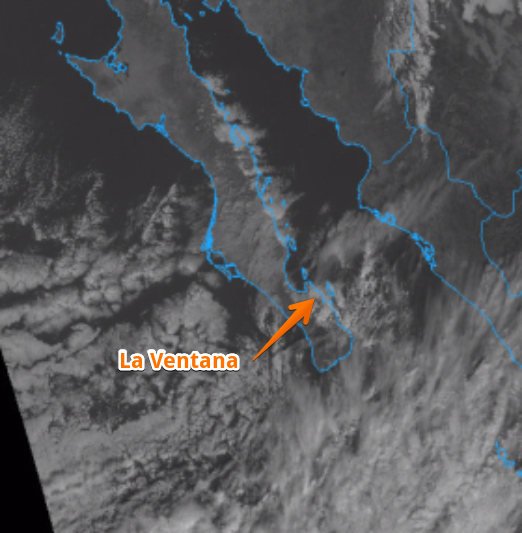 A bit of this wind is rippling over the mountains of Baja and hitting the water outside and sporadically creating strong WNW gusts in the El Sargento and La Ventana area this morning. This afternoon as our inland valleys heat that wind should turn a more favorable N. direction and curve towards the beaches. However WNW wind may continue just aloft so expect gusty shifty winds anywhere near shore. 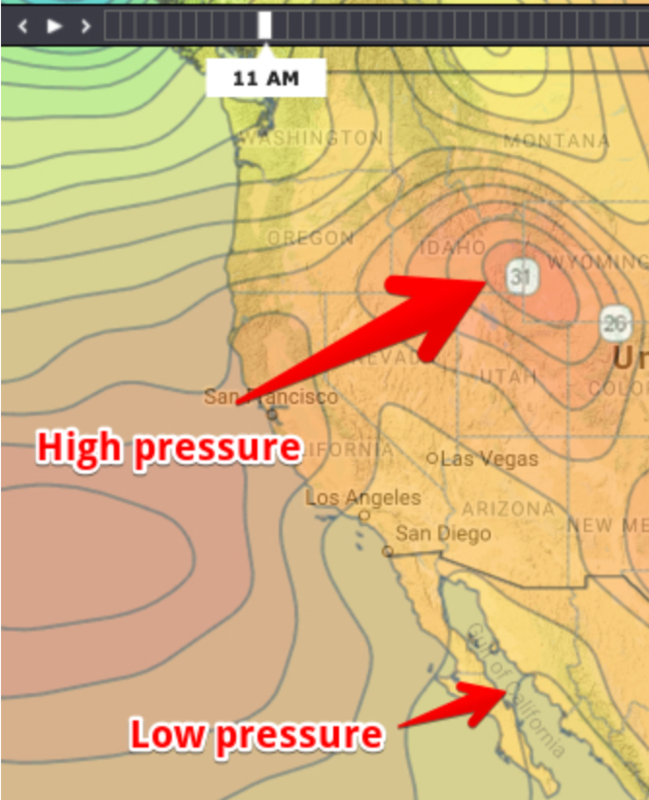 There is high pressure building in the Great Basin this Friday Tuesday, December 28, 2018. Right now it looks like the isobars only tighten over the northern Sea of Cortez Friday with a full El Norte wind event arriving at Baja’s East Cape Saturday. With strong surface winds turbo charged by strong NNE winds 1000 feet aloft we should see GUSTY winds in the low to mid 20’s range. There is a chance that high clouds may make it hard for the full brunt of the winds to reach the sand but just outside will be windy. IF we have blue skies Friday the weak El Norte winds on Baja’s East Cape combined with the local thermal winds may bring La Ventana and El Sargento into the mild upper teens as a preamble to the big winds Saturday. West Coast Wind Blog: Subtropical jet limits winds even more today. This satellite animation shows the high thin clouds from the subtropical jet stream that kept the inland valleys from fully heating yyesterday. That and the slight NNW rather than N. angle of the winds made it hard for the mid to upper teens winds to reach the beaches especially at La Ventana and Los Barriles. El Sargento had a sputtering start then hit the solid mid teens for a few hours. Today we have a solid high pressure in the Great Basin as you can see by the isobars around the orange area in the image. There is also a low pressure trough near tip of Baja. This combo is creating a pressure gradient in the La Ventana and Los Barriles area. The trick will be to get the resulting mid to upper teens El Norte winds to fill into the beaches. Here are the issues. The problem will be the upper level clouds from the subtropical jet stream that may limit heating in our inland valleys. The winds coming down the Sea of Cortez have an unfavorable NNW angle which makes it harder for them to curve into the beaches. Weak westerly wind just aloft from the pacific may tend to push the NNW wind away from shore.